The other day I mentioned how there's going to be no photo of Lilly with Santa this year due to her phobia of all costumed adults. Coincidentally (or maybe not), K.C. decided to put Lilly's last picture with Santa up on AwkwardFamilyPhotos.com. It was taken two years ago at a family holiday party at my office. While I'm sure we won't win the holiday picture contest - there are some really, really funny entries you must check out - I thought I'd share anyway. “Two years ago I was going through chemo for breast cancer. 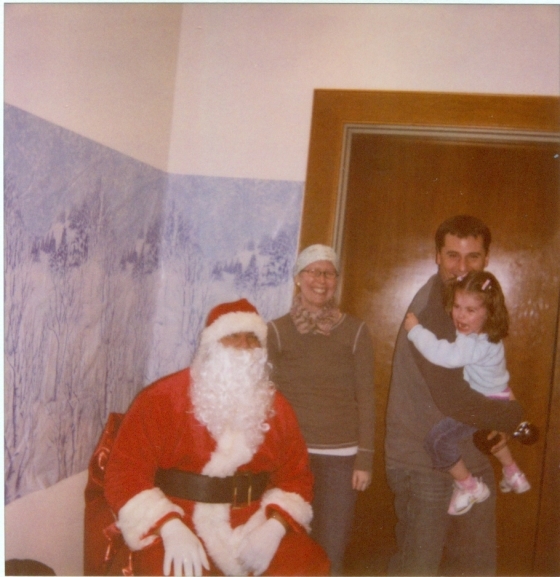 we forced our daughter- who is TERRIFIED of Santa to pose for a Polaroid picture. Pretty bad looking Santa. I don't think I would've reacted any differently. If you taught her not to talk to strangers, they don't get much stranger than this guy. Apparently this is a pretty common phenomenon... just got a similar photo of my nephew. Maybe it's more proof that mass marketing is potentially evil...? That is one unhappy little girl. Yeh, I think that's a common reaction to the guy in red. btw - I read a bit on your wife's blog and I have to say what a brave woman! Prayers and Merry Christmas wishes to your whole family! i was the same way as a child. never went to disneyworld and/or land because strangers in costumes terrified me. enough about costumed adults, as a fellow native philadelphia-arean, lets talk about Cliffmas and Mr. Lee. Merry Christmas to the three of you from the Dad family!! !